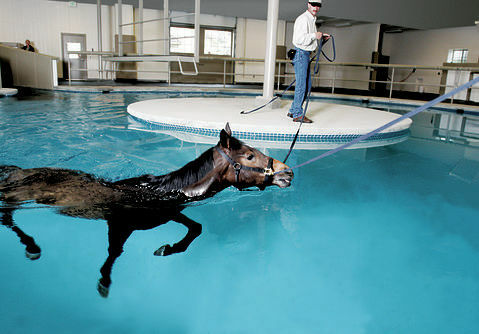 LWSC has arranged for a tour of Pegasus Thoroughbred Training & Rehabilitation Center in Redmond. The Pegasus Training and Rehabilitation Center brings together the ultimate resources and equipment for "care without compromise" of the equine athlete. No other equine center in the world features the Pegasus combination of leading exercise therapies, advanced cross training equipment and cutting-edge medical treatments, which make the difference between early retirement and optimal peak performance. That's why trainers and veterinarians from Kentucky, Southern California and Canada refer their thoroughbreds to this beautifully appointed 100 acre center just outside Seattle, Washington. The tour is planned for Saturday, March 24th and will begin at 1:00pm. We will email you to confirm that you can attend. We will keep a wait list, so if you receive confirmation and then cannot attend, please email president@lakewashingtonsaddleclub.org so we can give your spot to the next person on the waitlist. Submit the names and contact information below for each person who would like to attend. No unregistered attendees will be allowed. All attendees must be Lake Washington Saddle Club members.